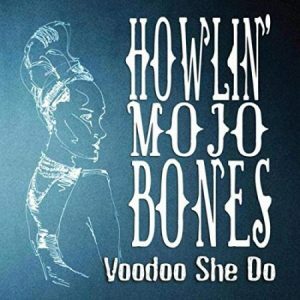 The four piece Howlin’ Mojo Bones was formed in 2016 and this is their debut album though the band members are all experienced musicians. The band is based near London and, like many UK blues-rock outfits, they seem to be particularly influenced by two British bands – Dr Feelgood and Free. All 12 songs are originals, credited to the whole band: Howlin’ George Witter is on vocals, Steve Crane on guitar, Gus Denton on bass and John Baker on drums. The band shows a variety of styles here, blues, rock and 60’s British R&B all being present and correct. The rhythm section keeps things moving ahead, Gus adds some melodic bass lines and guitarist Steve steps out to play some good solos, often evoking the spirit of Paul Kossoff, as in opener “Livin’ The Dream” which seems to be autobiographical as George sings of traveling the country in a “broken-down van”, played to a catchy riff. George has a distinctive vocal style, a touch of grit on some songs, more ‘conversational’ on others, such as “I Want My Life Back”,in which he regrets messing up a good relationship, his nasal tones supported by a Feelgoods style tune. 3. the title track “Voodoo She Do” has definite echoes of Brit R&B with its slashing guitar riff and rattles along well. This is a typical UK offering blending blues influences and rock-infused rhythms. As such it will certainly have an audience on the club circuit over here but may translate less easily to US audiences.